Now that I’ve finished writing my pregnancy and birth story, I get to move on to the fun stuff – Mom Life! Originally, I was going to speak from baby to tot, but I think I’m going to change my plan. I’m going to mix it up a bit. I will talk about the baby years, but I’ll also talk about the present. In addition, I’ll share about anything that is mom-related for me. Today I’m going to discuss what I’ve recently learned about positive discipline. “Positive discipline” is a branch under “positive parenting.” I spoke to Tanya from Little Hands and Me Parenting Network in Saskatoon. Tanya is a mom to three, and runs Little Hands and Me. She teaches Salsa Babies (for parents and kids) and baby sign language. She also runs a six-week course on positive discipline. On this occasion, I spoke to her only about positive discipline, but I have been to events in the past that included Salsa Babies. Both Anthony and I enjoyed it. Before she started Little Hands and Me, Tanya worked with high-risk families as a registered social worker. I was a little bit intimidated before speaking to Tanya (even though I know she’s a lovely person) because of my own faults as a mother. I can admit I yell, but I worry about the judgement that follows such an imperfection. Here’s something I learned quickly about Tanya (something I should have known from reading her social media posts): her job isn’t to judge. She is honest about the parenting issues she’s had in the past, and she shares how she has improved on these with the use of positive discipline. She’s there to help make parenting easier and more enjoyable. The reason Tanya took an interest in positive discipline was because she found herself frustrated and at her wits end. She wanted to parent using brain science, but she couldn't find any helpful resources, so she found her own solution. I had so many light-bulb moments while speaking to Tanya. I learned there are many simple things I can do that will help keep me calm, give me patience, and, most importantly, help my son with his toddler behaviour. The Positive Discipline Model is over 30 years old, and it’s used in 55 countries. It does not take on a one-size-fits-all approach. There’s so much to learn and adapt to your own parenting techniques. My son and I are learning to do this together. He’s learning about everything – constantly learning. I’m also continuously learning – all about parenting and all of Anthony’s new phases. I know that we will make some mistakes, and the only thing to do is learn from them and keep on going. An important pillar of positive discipline is “connection before correction.” This is big for me because I definitely yell before I stop to think about how to get through to him. Yelling doesn’t really solve anything for us, but I follow my first instinct to stop him. Instead of yelling, I need to get down on his level. I need to make eye contact with him. I need to ask him for a hug. Sometimes my son gets frustrated and he hits or bites. The concept of “calm before correction” is another pillar of positive discipline. We need to take a break... and then correct. This isn’t only for him. It’s also for me. I need to calm down before we can move on. This will also help with the yelling. I can stop before reacting. I can keep calm before reacting. Lately, I’ve been trying to get down on his level and make eye contact with him before doing anything else. I need him to look me in the eyes so I can explain how we can act differently. It’s a work in process. Positive discipline is based on building a mutually respectful environment. I need to have kind AND firm boundaries. One way of doing this is by simply empowering my son to make choices. I can give him limited options that we both can live with. An easy example of this is to let him choose what shirt he wants to wear. In my case, I need to specify which shirts or he will choose his digger footsie pajamas every time. The more he chooses, the more self-esteem and self-confidence he will develop. These teachings and values are effective over the long term. They will give my son long-term social skills and break down challenging behaviours. I am teaching him internal guidance and core values. Instead of choosing not to do something because he is fearful of the consequences, he will make the right choice because of his core values. My son is at the age where he does things that aren’t always nice because he can’t express his emotions yet. He doesn’t stop to think that hitting is mean because he is acting without being able to think it through. This is also why it’s important to calm him down before explaining why it isn’t nice to hit. Out of all the information Tanya gave me, my favourite part of our discussion was the “wheel of choice.” This can be used at any age. With my own tot, the wheel would only have a couple of choices. On it, I would have the option of two activities (for instance, bubbles and playdoh). When he is calm and happy, I can ask him which activity he wants to do. He’ll feel good about making the choice, and he’ll associate both activities with uplifting and happy moments in his life. This will help me when we are out and he’s decided to have a meltdown. Once he’s calmed down enough, I can pull the activity out, and let him calm down while being reminded of activities he associates with joy and positivity. After he’s calmed down, we can correct the reason for the meltdown and then head back to our original activity. When Tanya explained this idea to me, it seemed so simple and easy; it is a wonderful way to keep us both calm after a toddler meltdown. The best thing about positive discipline is that it’s not just for my toddler. It’s for me too. Self-care is so important and definitely proves to be helpful when I aim to keep calm in stressful situations. I need to be kind and firm to my son... and to myself. These are life-long skills that work for both kids and adults. Instead of yelling, getting upset, or saying “no” to my son when he’s misbehaving, I can go back to providing choices or an alternative. I can use distraction and redirection. If he’s trying to kick, I can remind him that he can use his feet for other things, like stomping or jumping. I realize I also need to pick my battles. An example of where I can apply this actually occurred while Tanya and I were speaking. 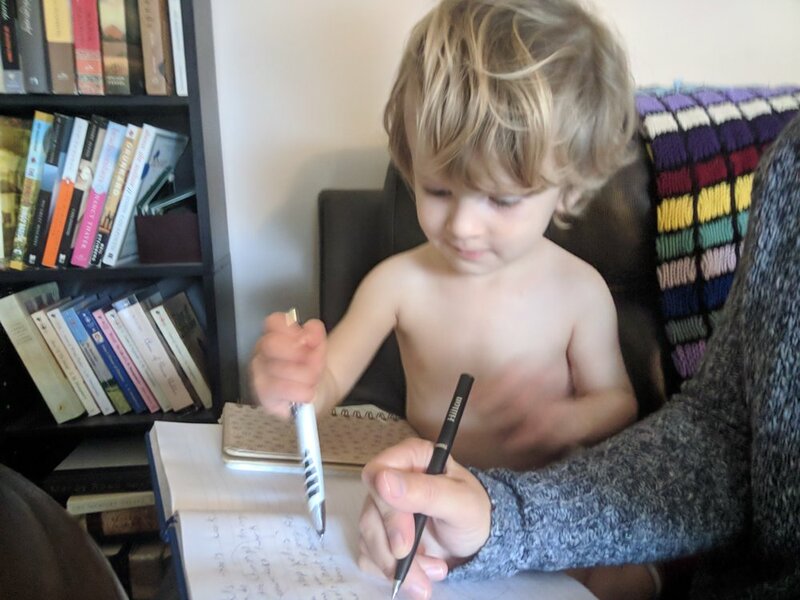 As I was writing, my son was helping me. He had a pen and was writing on the page with me. He then started to write on himself while I was writing. I allowed him to do this because I knew it could be washed off. He did try to move onto the couch though. At that point, it was important to let him know that instead of writing on the couch, he could use paper or himself. I have even given him his own journal to ‘write’ in. There were many things I learned from Tanya that seemed like it should be common sense, but when the stress of parenting (and the toddler tantrums) get to be too much, it can be easy to forget common sense and go with instinct. For me, that instinct is to yell. I am working on changing my instincts to make the situation easier for both my toddler and me. As he sees me changing and staying calm, he is also learning to stay calm. Sometimes. He is still a toddler. A little boy with BIG emotions he doesn’t yet understand. In closing, I can’t say enough about what I learned in our short meet up, and I can’t say enough about Tanya. She’s honest about parenting. She knows it is hard, and she believes in being truthful about Mom Life. She is there for parents who need help, but she keeps it fun. As a Mom, I am thankful for every resource available to parents; I am always looking for new moms that are striving to create a community to help others. That is exactly what Tanya is doing. If you’re interested in learning more about what Tanya teaches, please check her out on Facebook under Little Hands and Me Parenting Network, as well as on Instagram under the username littlehandsandme_yxe.